Featuring Sonos, Yamaha, Klipsch and more. It plays/ejects CD's/DVD's with ease, and tunes to AM/FM stations, but you will need an an AM/FM antenna to get better reception. 360W 4.1ch Music Flow Wi-Fi Streaming. 360W 4.1 Channel Sound System. Total Power 360W. Sound Bar w/ Wireless Subwoofer. Wireless Subwoofer. Subwoofer Weight 9.5 lbs. Subwoofer Speaker Type Wireless. Wall Mount Bracket x 1. CINEMA DSP, Quad-Field CINEMA DSP, SILENT CINEMA DSP, Virtual CINEMA DSP. 75 Watt - 8 Ohm - 20 - 20000 Hz - THD 0.06% - 2 channels (surround). 80 Watt - 8 Ohm - at 1 kHz - THD 0.7% - 2 channels (surround). Design: Two-way, three-driver center channel. Frequency Response: 80Hz - 20kHz ( /- 3dB). Weight: 14 lbs Each. Sony S-Master HCD-FX10 Digital Amplifier CD/DVD Home Theater System 5 Disc Chang. Condition is Used. Shipped with USPS Priority Mail. SONY 3D DVD Bluray 5.1Ch 1000W HDMI(in/out) LAN Home Receiver Amp HBD-E280. Great picture on this unit. Works perfect. No remote. A few scratches on top. AUTHORIZED BOSE DEALER! FACTORY SEALED! WARRANTY! Sony BDV E-580 DVD/Blu ray Home 3D Player Receiver . Condition is Used. Shipped with USPS Parcel Select Ground. Wireless Music System Bring your favorite music to life, with the deep lows, powerful kick drums and the clarity your sound deserves. Power up your playlists, listen to your favorite audio apps, CDs, radio stations, and more, all in one easy to use stereo system for all your musical needs. Technology Powerful, all-in-one design Fill the room with sound from this full function, all-in-one stereo system featuring 700 watts RMS power, 2-way speaker system and dedicated 8 inch subwoofer. The MHC-ECL99BT rivals the performance of larger, more complex stereo systems with far less clutter. Trending at $189.99eBay determines this price through a machine learned model of the product's sale prices within the last 90 days. We will do everything in our power to make you happy. Product: DVD Player/Theater System. Do not believe US TEST US. We are based in the U.S.A.
To ensure the best sound quality, the BT2A features a Wolfson® Digital-to-Analog converter (DAC). Plus, for simple compatibility with your existing devices, the receiver includes analog cabling for connections that require 2-channel RCA audio, or 3.5mm audio. As Pioneer’s Chief Speaker Engineer, Andrew has designed multiple lines of award winning loudspeakers. He is considered an audio master in the industry. Enjoy smooth, and room filling sound with the Pioneer SP-SB23W Speaker Bar System. Progressive scan DVD player. DVD Player. Player Type DVD Player. 5.1 Channel Cable. Key Features. Channels 5.1. Provides a clear and high quality sound experience for watching your movies and videos. Component Video (In/Out) Yes. PVC insulation, Tinned copper conductor. (Stranded). Maximum Conductor Resistance: 59.4 ohm/km. (at 20 °C). Included Components Radio Tuner, DVD Player. Radio Tuner AM. 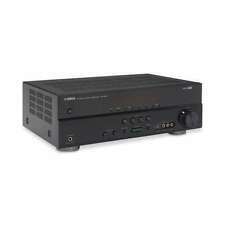 OTHER Features AV Receiver, Digital Tuner, DVD Player. DVD player works good but I coulden't get the radio to work. Playable Disc Formats CD, DVD. Art Sound Wireless 32” Sound Bar W/ Bluetooth, Mountable, RCA, Aux In, Stereo, with Remote. New - open box. New ListingSamsung HT-H4500 3D Blu-Ray Complete 5.1 Home Theater System. 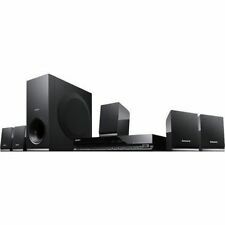 Samsung HT-H4500 3D Blu-Ray Complete 5.1 Home Theater System.. Condition is Used. Shipped with USPS Priority Mail. 4.5 out of 5 stars - Samsung HT-H4500 3D Blu-Ray Complete 5.1 Home Theater System. 6 product ratings6 product ratings - Samsung HT-H4500 3D Blu-Ray Complete 5.1 Home Theater System. Salerno media labs 5.1 Home Theater System . Shipped with USPS Priority Mail. We try to describe every item that we list to the best of our ability. We are not perfect, we are a human beings just like you and we do make mistakes. SEE PICTURES. make Supersized seem small. Get images that. Speaker cable for each speaker will be included as well. Speakers appear like-new and have been tested. Samsung HW-J550 BT soundbar Wireless Subwoofer. Condition is Used. Local pickup only. This set received light usage for 3 years. It is in excellent physical condition and still sounds great. Only trying to sell it because the subwoofer causes disturbance with neighbors in apartment complex. Comes with soundbar, subwoofer, remote control, power cords and optical cable. AFTER INSPECTION, I FOUND THAT A FEW OF THE SPEAKER WIRES WERE UNWOUND AND THEN WOUND BACK UP AND ZIP-TIED. This item is used. The item shows average signs of wear and tear including scuff marks, scratches, nicks, and worn finishes. We could not fully test the unit as we didn't have a compatible subwoofer/bass module (amp), but we did power it up, roll through the sources, and eject the CD tray. Use the line-in jack to connect mp3 players to hear your favorite music with impressive sound quality. HDMI output – HDMI outputting 1080p video. LINE IN connection – for iPod and other portable audio players. Internet access required. This item is used, the blue ray has minor scratches on top, speaker wires are new. The item was tested and works properly. Unit is in good shape and works great. All cables are included. Remote is NOT INCLUDED. It is working order 100%. Does not have it's Power Cable or any other wires.Just the Bose Receiver. Cleaned & Tested thoroughly. The sound is beautiful. It does not affect performance at all. The rest of the system is in superb condition with almost no wear to speak of except for the on/off button which is starting to wear away(see photo 5). Condition is New. WITH HFS Bass boost and dual subwoofer programming. -Digital HD sound Ready. -Magnetically shielded Center speaker. Still in box. Two total. -TWO 6.5 speaker subs. -Efficiency : 88dB. We proudly stand behind the quality of our products. 65 Point Inspection. We are sure that we can provide a solution that makes you happy. No problem! We've got it all covered. 25 Years experience. REMOTE COMMUNICATES WITH RECEIVER. AM ANTENNA WITH CRACKED BASE. 4 L/R/ FRONT & REAR SPEAKERS SS MSP 75. ONE CENTER SPEAKER SS-CNP74. UP FOR SALE. Achieve enhanced sound quality compared to your TV's speakers with the Sony HT-CT800 350W 2.1-Channel Soundbar System. The soundbar features three HDMI inputs, optical, and 1/8" audio inputs for connecting a variety of audio sources. This Blu ray sound system has been tested to ensure the best possible quality. The sound system is in good overall physical condition. Sony, Samsung, Toshiba, Etc. Each cable is made by professionals using the proper crimping tools and procedures as specified by manufacturer, in a professional laboratory setting. A note about Sony part numbers. Trending at $474.64eBay determines this price through a machine learned model of the product's sale prices within the last 90 days. It is in EXCELLENT used condition and works as it should with no issues! Trending at $750.00eBay determines this price through a machine learned model of the product's sale prices within the last 90 days. No matter what channel you are watching, home theaters can dramatically improve your TV-viewing experience. Alternatively, they can also be used simply to filter sound throughout your entire home. Home theaters are known for being powerful sound systems that produce superior sounds for your listening pleasure. How does a wireless home theater system work? 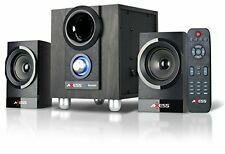 Many brands offer wireless surround sound home theater systems. As the name implies, these types of systems serve as solutions when you don't want to have wires everywhere. A home theater that wirelessly broadcasts audio is powered the same way as any other kind of wireless home audio product, such as your wireless stereo. Conventional home audio speakers receive audio from a wire that connects to them from the amplifier of the AV receiver. With a wireless system, though, your audio is transmitted wirelessly to the receiver of the home theater. The system utilizes wireless technology to send out a series of signals that the receiver picks up to transmit the sound. Are all satellite speakers wireless? Not all satellite speakers are wireless, but many satellite systems offer this option. While there are many advantages of wireless speakers, plenty of people also enjoy wired home theater systems, too. If your home theater system is going to be set up in a location where the wires won't show much, then it might not be a big deal for you to have a few wires connecting your system together. What brands of home theater systems are there? What is a multi-room audio system? A multi-room audio system is a system that features speakers in multiple rooms within a house. This allows you to fully experience the sound of music throughout your home. With a system like this, you can conveniently broadcast your favorite music or television program over the system to listen to while you're cleaning or engaging in some other activity. Many multi-room audio systems feature speakers that include audio amplifiers. Some also include receivers that allow you to control the kind of music or TV program broadcasted over the speakers via your computer or smartphone. This makes it so that you can easily control the sounds in your home from one convenient device.